Macrolepiota excoriata is in many respects a miniature lookalike of the Parasol Mushroom, Macrolepiota procera. Like its larger cousin, this is an edible mushroom but much too scarce to be a serious target for commercial pickers. 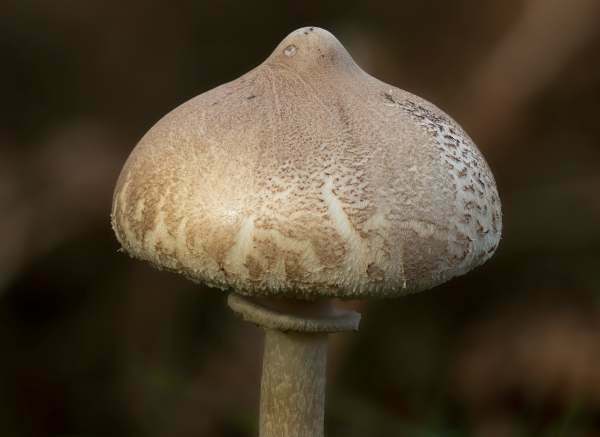 Infrequent in southern Britain and Ireland, and even less common in northern England and Scotland, Macrolepiota excoriata occurs also in many countries of central and southern mainland Europe and in parts of North America. The specimens shown here were photographed on 18th December 2012 in the Algarve region of southern Portugal. Originally described in 1762 by Jacob Christian Schaeffer, who named it Agaricus excoriatus (most gilled fungi were placed initially in a gigantic Agaricus genus in those days), this mushroom was given its present scientific name by Ukrainian mycologist Solomon P Wasser (born 1946) in 1978. 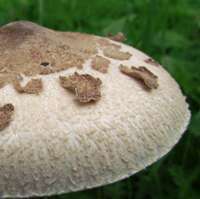 Synonyms of Macrolepiota excoriata include Agaricus excoriatus Schaeff., Lepiota excoriata (Schaeff.) P. Kumm., Leucocoprinus excoriatus (Schaeff.) Pat., Leucoagaricus excoriatus (Schaeff.) Singer, Leucocoprinus heimii Locq., Lepiota heimii (Locq. ex Bon) Contu, and Macrolepiota heimii Locq. ex Bon, Boll. The specific epithet excoriata refers to the way that the scales draw away from (excoriate) the margin of the cap. 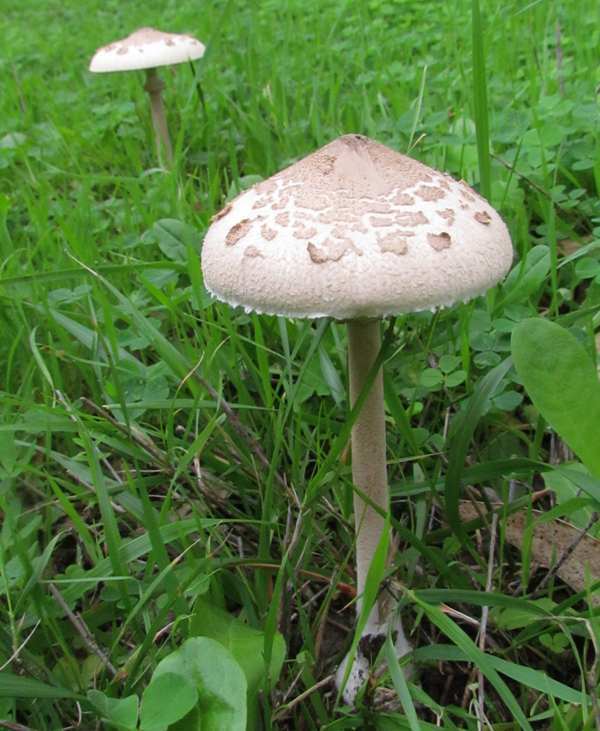 Several former members of the Macrolepiota genus are now sited in the genus Chlorophyllum, which contains some large parasol-like fungi that are now known to be toxic to many people - for example Chlorophyllum rhacodes, the Shaggy Parasol, which used to be known by the scientific name Macrolepiota rhacodes. Initially hemispherical, becoming broadly convex with a small umbo, the cap surface is very pale brown with large brown scales and an intact brown central zone that is darkest over the umbo The cap flesh is almost white and does not change colour significantly when cut. Cap diameter at maturity ranges between 5 and 9cm. The outer scales are irregular, large, and have upturned edges; there are no scales at the margin, which usually remains slightly downturned. 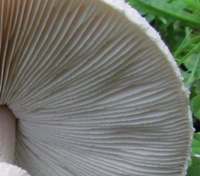 The broad, crowded gills of Macrolepiota excoriata are creamy white and free, terminating close to the stem. Gill edges are finely floccose. A large single pendent floccose ring with a narrow brown margin persists around the stem of Macrolepiota excoriata but often becomes movable on old specimens and sometimes falls towards the base. The stem surface is fairly smooth, pale cream with a slight pinkish tinge and finely velutinous below the ring. Inside the stem the tough white fibrous flesh is loosely packed and initially solid, sometimes becoming hollow with age. 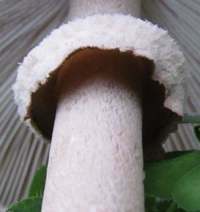 Noticeably swollen at the base, the stems of Macrolepiota excoriata are cylindrical over most of their length; the diameter ranges from 0.7 to 1cm (expanding to 2cm across the bulbous base), and the stem height can be up to 14 cm. 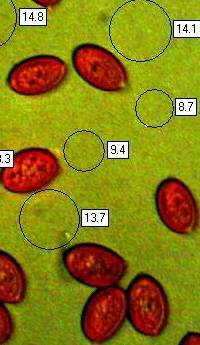 Ellipsoidal, smooth, thick-walled; 13-18 x 8-10µm; with a small germ pore; dextrinoid. Faint odour and taste are pleasant but not distinctive. Saprobic, uncommon and mainly found on roadside verges (often on poor sandy soils), in permanent pastures, and in grassy areas next to woodland, growing alone or in small trooping groups; also reported occasionally from stable grass-covered sand dunes. August to November in Britain and Ireland; later in the year in southern Europe. Chlorophyllum rhacodes, the Shaggy Parasol, is stockier than Macrolepiota and it has a smooth stem. 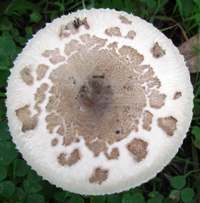 Macrolepiota procera, the Parasol, is larger and has a snakeskin pattern on its stem. If you gather these lovely mushrooms to eat, be aware that the somewhat similar Shaggy Parasol, Chlorophyllum rhacodes, can cause tummy upsets. The Shaggy Parasol has flesh that turns red when it is cut, and its stem lacks the velutinous texturing below the stem ring.